Hunting for the best gifts for travel lovers? You know, besides an actual plane ticket? Contrary to popular belief, travellers aren’t actually that tough to shop for. We’re only mildly tough to shop for 😉 I admit, we can be a picky bunch, but there are plenty of awesome, practical and cool travel gifts we usually have our eye on. 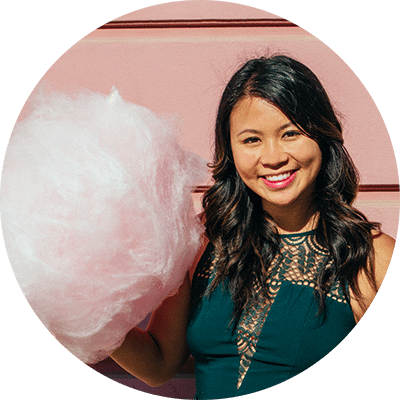 Luckily for you, this post is like a peek into the wish list of a travel lover (a caffeine-crazed and highly neurotic one, to be specific). So, stop stressing about travel themed gift ideas this Christmas. Here’s my roundup of travel gifts for every budget! PRO TIP: If you’re doing your shopping *this* last minute, sign up for a free trial of Amazon Prime (the best thing ever) and get gifts delivered the next day. You can always cancel your trial before they bill you, or even get a full refund if you don’t use your Prime privileges after you’re charged. You can find some killer last minute deals here. Travel Gifts for Women: The list for you if you’re looking for travel themed gifts that suit the wanderlusting lady in your life. Travel Gifts for Men: A roundup of the best travel related gifts for men – ft. loads of options for all price ranges. Personalized Travel Gifts: If it’s super thoughtful gifts for a travel lover you’re after, don’t miss this guide, with all sorts of personalized goods from luggage tags to decorative wall art. Travel Gifts for Business Travelers: A lengthy roundup of gifts for people who travel often for business and work. Travel Gifts for Mom: Travel themed gift ideas for moms, from the wonderfully sweet to the helpful and practical. Travel Gifts for Dad: A comprehensive list featuring the best traveling gifts for dads who love to travel. Alright, let me guess: you’re just perusing for information and general inspiration. Don’t worry, I’m sure that lightbulb moment will hit you soon. Here’s an extensive roundup of various gifts for people who love to travel, just to get those ideas flowing. If there’s one thing travel lovers value more than stuff, it’s experiences. 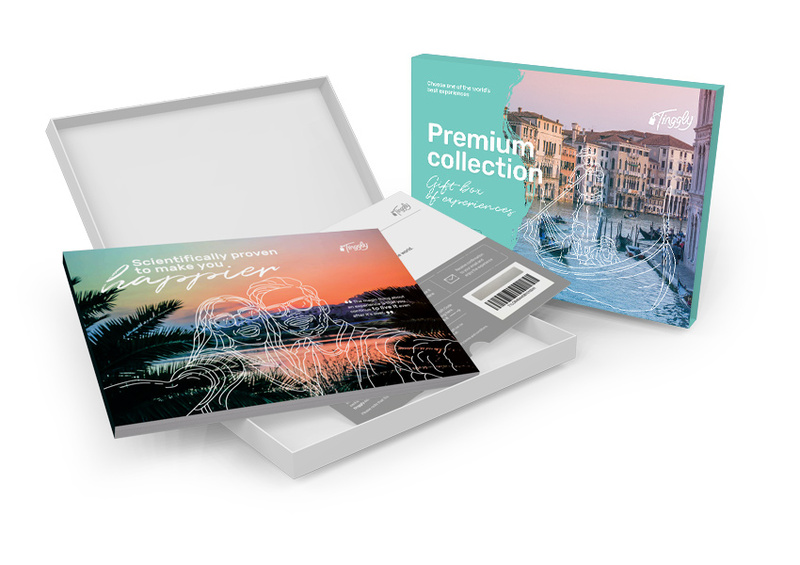 Unfortunately, gifting ‘experiences’ can be a bit of a challenge when you don’t know where your traveller is headed next, what they want to do or you know, if you want a physical gift for them to unwrap (a crucial part of the holiday magic, if you ask me). Enter Tinggly. Tinggly allows you to purchase a gift box that’s filled with hundreds of potential travel experiences that the recipient can choose for themselves. This takes the guesswork out of knowing what experience to buy, what destination to buy for, and also eliminates the awkward non-gifty feel of a printed receipt or voucher 😛 Different boxes offer specially curated sets of experiences, from ‘Bucket List’, which has options like paragliding in Switzerland and hot air ballooning in Jordan, to “Happily Ever After”, with romantic experiences like sunset helicopter rides in Vegas and Northern Lights chasing in Iceland. All of these are then packaged up in beautiful boxed sets (or via email if you want immediate delivery). If you’re looking for a foolproof gift your traveller will 100% love, this is it. Click here to check out the different options for Tinggly boxes. Sometimes, the best travel themed gifts are the most obvious ones, AKA anything with a freaking map on it. As basic as it sounds, one of my favourite ways to flaunt my travel obsession is simply through wearing very obvious things like erm, a scarf with a map print on it (yes I do own this) or lugging around a badass passport cover. Here are some awesome gifts to get a traveler (all with an overtly travelly theme). I own one of these at home and it’s genuinely one of my favourite things I own. It’s a gorgeous world map that has a scratchable coating (made like scratch lottery tickets) that magically reveals beautiful colours once you scratch off places you’ve been to. It’s a very affordable but thoughtful gift – one that’s perfect for chronic wanderlusters. Warning: gifting one of these might result in sudden desire to visit Russia – the most massive slab of scratchable turf there is. In my opinion, passport covers are one of the simplest but best traveling gifts you can buy if you’re looking for something thoughtful but still highly affordable. My passport is practically in tatters from all the wear and tear, and I know this is the case for many frequent travellers. Weirdly enough, this is never something I think to splurge on for myself, and just anecdotally, I’ve heard it’s the same for many others. SO, be a hero and gift one! It’ll definitely be appreciated. Click here for the best deals. The beauty in this gift is that there’s so many awesome designs out there, so you can easily personalize it. You can even get one custom made here with their names, initials or silly nickname. Sure, it’s not exactly one of the most subtle gifts for travel enthusiasts, but I’d never be upset about getting a luggage tag, especially one that’s stylish and fun. Frequent travellers will be seeing and using their luggage constantly, so a nice one that they love is a must (like this adorable one from Vera Bradley). 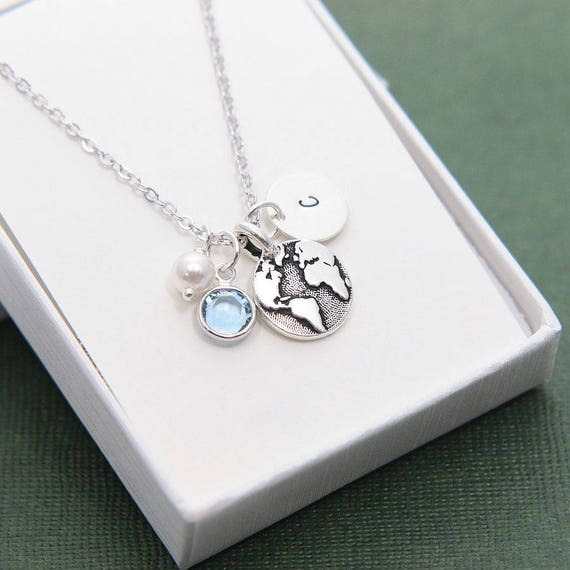 Okay, I get it… a globe-shaped necklace takes “travel themed gift ideas” to a shameless new level, but trust me when I say this: if you’re looking for a sweet gift that’s equal parts thoughtful and “pretty”), this is it! Travel-themed accessories are a great way to subtly flaunt one’s obsession with the world. I love Etsy for this – they have a gorgeous selection to choose from and you can even get personalized pieces for that extra special pizazz. Check them out here. We travellers are often practical people. It should come as no surprise then that the best travel related gifts are often the ones that incorporate an element of practicality. Enjoy this list of cool travel gifts with a practical twist. AKA proof that we’re living in the future. These phone cases charge your phone for you, making them ideal for the perma-connected traveller. Scope out the many options on Amazon here. Ideal for adventures both at home (i.e. Netflix binges) and abroad (Netflix binges at the hotel), portable bluetooth speakers are great travel gifts. What’s crucial is that you find one that is relatively small and waterproof, so they can be lugged around on adventures all over the world. Here’s a popular, highly-rated choice from Amazon. With the rise of #iPhoneOnly photography, one of the best gifts for travelers you can buy are these badass smartphone lenses! From fisheye to macro, there’s all kinds of cool lenses to play with – and will maybe help them take more interesting shots than the classic drunken selfie 😉 I have this set from PNY Technologies and love it. The super wide angle is perfect for getting epic backgrounds into selfies, and can get way more into landscape shots too). If you’re looking for an equivalent for North America, these lenses are among Amazon’s top rated. In terms of which brands to go with, I always recommend Samsonite. My hardside spinner set has been with me all around the world (click here for a similar set) and it has not once let me down. PS: I’ve always found that ordering these online can be cheaper than in-store, so click here to browse the best deals. Taking selfies + following the blue dot on Google Maps = instant low battery. That’s why a portable charger makes the perfect travel gift! There are a lot of options out there, but I’m a big fan of this Anker PowerCore+, which is small, portable and has amazing reviews on Amazon. A pair of good, noise-cancelling headphones can a serious lifesaver and one of the best gifts for travel enthusiasts you could buy. I personally love my Bose headphones in spite of their hefty pricetag, and I firmly believe they’re worth every single penny. You can shop the best deals on them here. If your goal is to go the extra mile and really splash out on one of the best travel gifts money can buy, you can’t go wrong with gifting a new GoPro. The latest iteration of GoPro has super high quality photos/video and supreme portability and durability to boot. Click here to shop great deals on GoPro. Most travellers I meet on the road these days prefer to take an iPad with them rather than a computer. I mean duh, it’s lightweight and is perfect for watching Netflix on the road  Definitely a worthwhile purchase, and the perfect gift for a guy who travels often. Click here to shop the best deals online for iPads. One of my favourite ideas for cool travel gifts is something that allows the traveller to satisfy their itch for adventure, even when they’re not travelling. Here’s a fact: travellers crave experiences, which is why a voucher for a cool experience will always go over well as a gift! If you think that this kind of gift is out of your budget, don’t worry! There are a lot of great sites out there like Living Social where you can scope out discounted experiences like cool restaurant outings, adventure sport tours, boat rentals, classes and more… usually at steep discounts of 40%+. After a quick look for my hometown (Vancouver), I found tons of amazing experiences from scuba diving certification to pasta and bread making with a pro. There are SO many cool options and I’m confident you’ll find a good fit. I hope you enjoyed this roundup of the best travel gifts! If even after all this, you’re still not satisfied and want more inspiration re: good travelling gifts, be sure to check out the Gift Guides section of my site! Fingers crossed Santa is good to you this year!